Have you heard of a dog training treat pot? It’s pretty much what it sounds like. If you are going to train with food, you’ll need containers to put it in. So what does the perfect treat pot look like? And what does it have inside? Today’s choice of dog training secrets may seem obvious to some. Others will kick themselves for not making better use of what is an important strategy shared by all successful positive reinforcement trainers, the world over. It isn’t so much what is inside the treat pot that counts, or what shape it is. It is where you keep your treat pot that really matters. Many of the opportunities we have for improving our dogs’ behavior do not take place inside any kind of formal training session. In fact, the vast majority of your dog’s learning takes place outside his training sessions, as a normal part of everyday life. There’s the moment your dog steps back from the doorway to let you go through first, or the moment you are loading the dishwasher and he looks up at you and pauses instead of diving in to lick the plates. What about when your dog goes and lays in his bed for the first time as you sit down for a meal, or sits nicely to greet a visitor at the door? Or there’s the first time he settles in his basket in front of the TV without being asked, or brings you the keys you didn’t realize you’d dropped in the hall. Each and every day, there will be hundreds of little opportunities to reward your dog and reinforce good behavior. This happens constantly in every home up and down the country. And the vast majority of the time, these snippets of good behavior go unrewarded. Not necessarily because they are unnoticed, but because there is no reward to hand. You can see where I am going with this! The ideal treat pot is the one you can reach. The one that is to hand, on a nearby shelf. The one next to the TV or the kettle, the one on the hall table or the bookshelf next to your sofa. And the perfect treat pot is one of many. Ideally, there should be a treat pot in every room to which your puppy has access, and another attached to you. With small puppies, I wear a treat bag all day, so I can reward any good behavior that appears right as it happens. It isn’t what your treat pot looks like that counts, nor so much what you keep in it. What really matters is that it is there, available, instantly to hand, whenever you need it. Because the truth is, you cannot predict when that need will arise. The moment your dog gives you that great ‘default sit’ you’ve been waiting for. Or the moment he stops scratching at the back door and looks at you to let him out. The moment he relaxes, the moment he decides to go and lie in his bed while you eat your breakfast. These are opportunities to reinforce good behavior, and there are dozens of them each and every day. Be prepared. 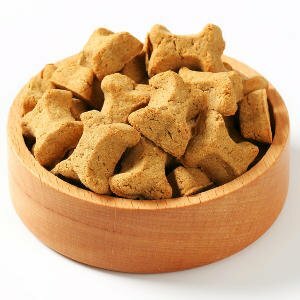 Put treat pots around your home so that you can reward your dog every time he deserves it.